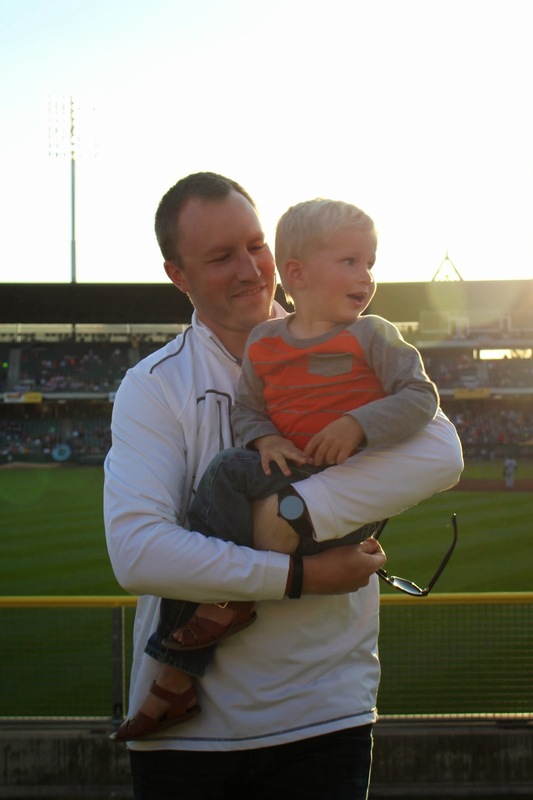 Saturday night we took Liam to his very first baseball game! We obviously thought that his first visit to the stadium would be Safeco Field in Seattle to watch the Mariners play, but that will have to wait. Perhaps we will save that experience for his first MLB game. Instead, we watched the Salt Lake City Bees play in the minor leagues! Liam was somewhat enamored with the bee mascot, but kept calling him a bug.. So apparently we were at a "bugs" game! We were joined by some friends whose little boy is just a year younger than Liam. They are quickly becoming some of the best of friends; I see many games of catch in their future! We bought general admission tickets, so we could stake out a nice little spot of grass in the outfield. Peanuts & sunflower seeds all around! 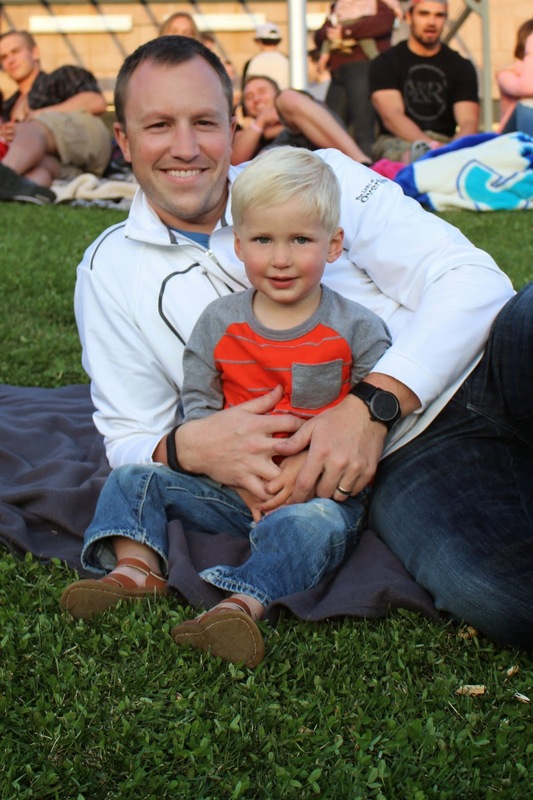 There were train rides (yep, a train at the stadium), "rollies" down the grassy hill, & dance moves galore whenever one of Liam's current jams came on the speakers! Once he got a bit of the crazy out, he was excited to sit on our laps and actually watch the game. We talked about the pile of dirt (pitchers mound) and the guy wearing the helmet with the bat. I love Liam's curiosity as he begins to figure out what is going on. I kept hoping for a homerun, so that Liam would have the opportunity to see a ball come flying all the way over the fence! Well just that happened!!! I ducked for cover while Conor tossed his (almost empty) beer down & feverishly staked out a spot to catch the ball! No other man, woman, or small child even stood a chance. This dad was going to make sure he got a homerun ball for his son! I so wish I had captured the whole thing on video! 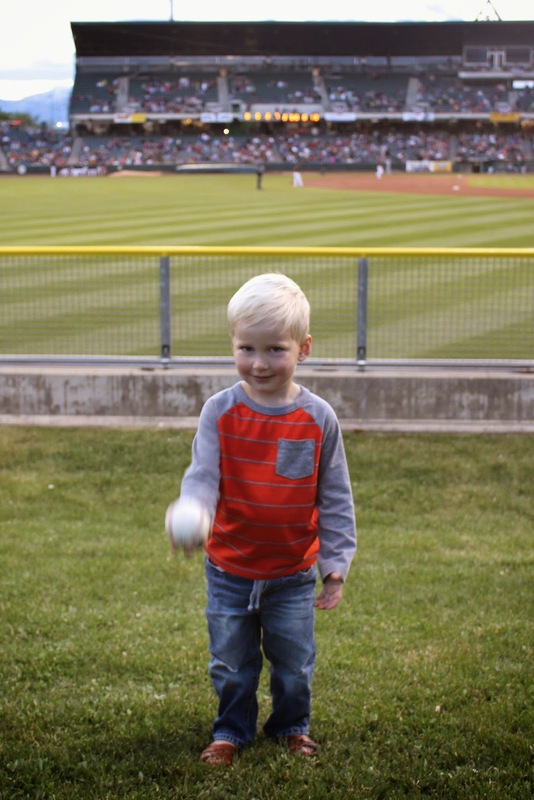 Liam was thrilled to have his first baseball; he wanted to play catch with it right away! His catching skills are still lacking a bit, but his arm is improving. Perhaps we have a future pitcher on our hands! Then he wanted to play catch with the players on the field, so we hastily put the ball away so Liam wouldn't throw it back on the field. I don't think he is ready for the minor's quite yet! Overall the night was a huge success! It was exactly the kind of Saturday night I was hoping for. A special time to be our little family of three and just focus on Liam before the baby is here. I'm truly enjoying every last minute that it is just us! Such a sweet and fun memory!!! So glad yall hid the ball before it was thrown back over the fence ;) sounds just like something Lily would do. It makes sense, right?! So glad yall are making the most of this special time before baby Finn arrives!!! Such a perfect Saturday night!! 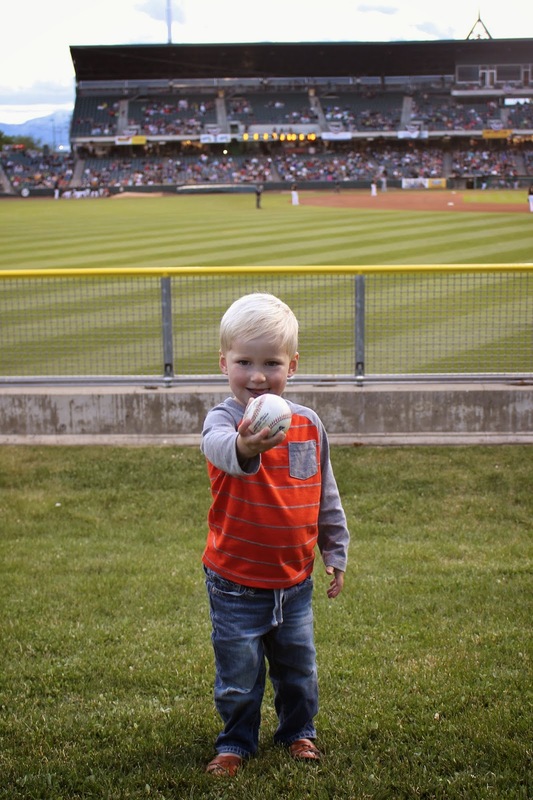 Glad he loved his first baseball game - and that all of your snow is gone! That was crazy! What a fun evening (and souvenir)!! :) I love the relaxed atmosphere at minor league games, looks like you've got a fan in Liam. 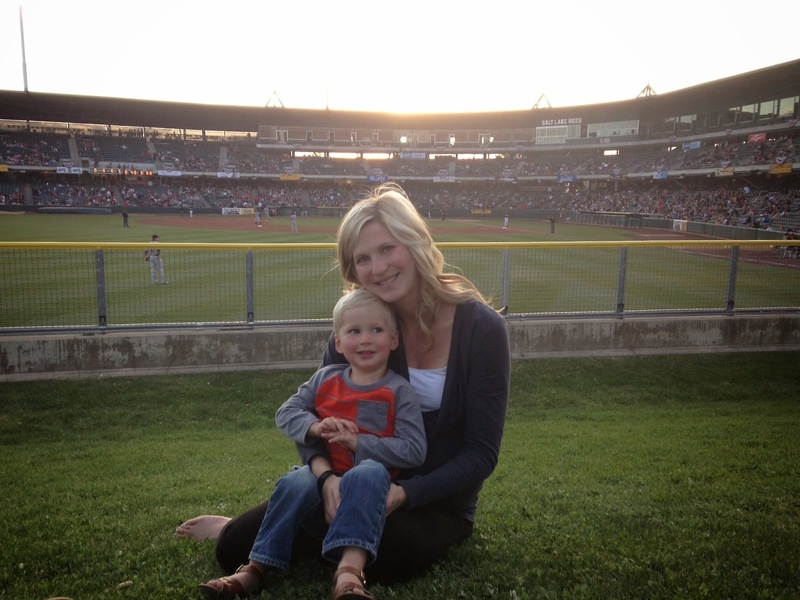 I am so looking forward to nights at the ballpark with my little. I sure hope she grows up with a love of baseball! How awesome! That is absolutely perfect! We love baseball so much. And where is your Finn belly in that picture?! Perfectly concealed lol. Haha, I love Courtney's comment! You don't even look pregnant in that picture! Such a fun night! So much fun! Kudos to Conor for making it a truly great kid day! It was! Now Liam is going to expect to get a ball at every game, ha! How fun!!! I'm so happy you guys were able to make it to a game! So awesome that Conor was able to get a ball for Liam! I bet he was in HEAVEN the whole time!